A native Washingtonian, Paula Pree developed her love of harmony at an early age. The family of five often sang together, and she fondly remembers the first song she learned in harmony, Fairest Lord Jesus when she was four years old. Paula began her journey of song in the third grade choir at St. Joseph's Elementary School, where Latin masses and Gregorian chant were the usual fare. She was a member of the Glee Club at St. Cecilia's Academy. She sang with several choirs at Israel C.M.E. Church, while also sponsoring and directing the Youth Choir, and has co-authored and directed dramatic productions for the Sunday School Department. 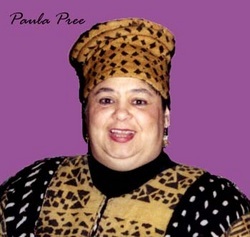 As an actress, Paula has appeared in African American Collective Theatre productions of The Trials of Brother Jero and One Monkey Don't Stop No Show. Paula has been with In Process… since its origin in 1980 and is also the contact person for the group. She sings the haunting song In the Mississippi River on the self-titled CD and can be heard singing all parts, often adding a rich bottom to the group's sound. She is the force that keeps the group organized and moving forward to the next experience. While Patchwork Quilt and the In Process… signature song Love Is All Around Me are her favorites in the contemporary repertoire, Paula finds that keeping alive the age-old harmonies and rhythms of the ancestors strengthens, renews, and reinforces the connections to her heritage.